E-mu Emulator 1-page "E-mu Systems of Japan" advertisement from page 71 in Keyboard Magazine April 1983. You would think I dug up this ad up after I mistakenly clicked the "Buy it now" button on some Japanese synthesizer magazine auction. But you'd be wrong. 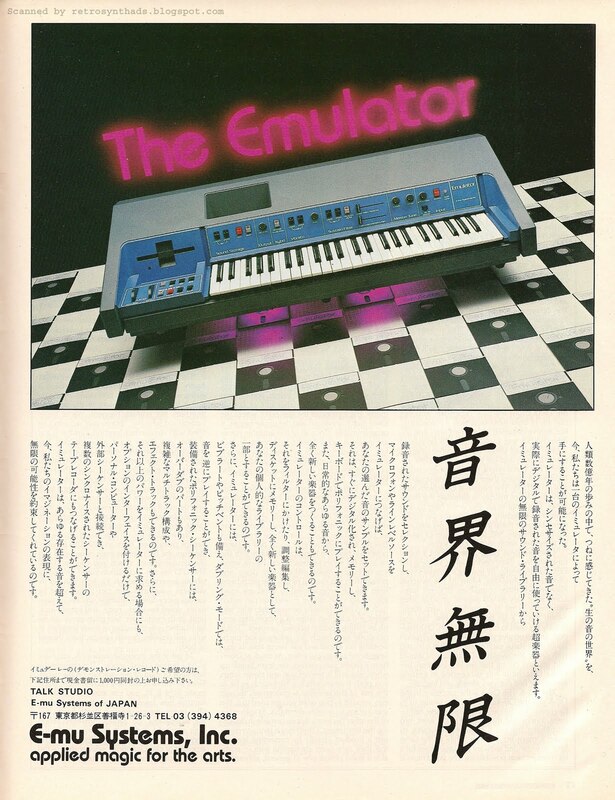 This ad popped up out of nowhere in the April 1983 issue of Keyboard and was the last readers of Keyboard would see from the Emulator front until the first Emulator II ad showed up in January 1985 (that's not to say E-mu wasn't advertising during this time period - the introductory Drumulator ad was already making appearances). Interestingly, this advertisement used the same top image that was found in my previous Emulator "Breaking the sound barrier" ad post. If you recall, that ad only ran once as well, so it appears that E-mu only advertised the Emulator in two issues of Keyboard between March 1982 and January 1985. That is eight and six months respectively between showings. You may also recall from my last blog post that I didn't think the reason for the brief ad appearance was to try and sustain sales of the Emulator. The ad only ran once, hardly enough to keep long term sales going, and its widely documented that Emulator sales during this time period were steady, even without constant advertising. No, I had another theory and ended my previous post with a bit of a dramatic cliff hanger, like those with great theories tend to do. E-mu wanted to introduce readers to that new cool/modern Bauhaus-font-based Emulator logo! You see, before these neon/checker board ads, the Emulator logos found in ads were quite different. I've included an image of the E-mu identifiers found in those previous E-mu ads below - the square images are the "Emulator" logo/logo-type found on the actual instrument photos from the ads, and the longer images beside the square images are the logo-type for E-mu Systems, Inc, found in the bottom right-hand corner of the ads. Being a logo freak, I just had to ask Marco Alpert (visit his personal Web site/blog! ), long-time marketing manager for E-mu, about the evolving Emulator/E-mu logo. "The old logo predated my arrival. After I came on board, the E-mu logo slowly evolved, becoming more modern with the rounded font. An interim logotype appeared on the original Emulator, with the Bauhaus version debuting on the Drumulator and remaining current through the SP-12. Apart from the logotype, there wasn't an actual graphical logo again until the mid-to-late 80s." So, even though the original Emulators never had the Bauhaus version of the logo on it, it was used in these latest Emulator ads above the Emulator. Logo evolution in action! And what I like even more is that the Bauhaus font was also used for the new tag line as well - "applied magic for the arts". Nice! So, was I correct in my theory? Was the brief Keyboard appearance of the "Sound barrier" ad just to introduce readers to this great new logo? "We ("we" being me, the late (and sorely missed) Ed Rudnick, and Kevin Monahan, (who was largely responsible for growing the sound library) went down to Winter NAMM '82 with the company in near dire shape (Dave and Scott stayed home to save money) and came back with more than 8 months of backorders. It was an amazing weekend. Since we couldn't make any more than we were selling for most of the next year, it seemed wiser to focus available cash on production and, later, development of the Drumulator than more advertising. But by the time of the Breaking the Sound Barrier ad, we had caught up and figured it was time to remind everyone of what the Emulator had evolved into and to start really pushing the value of the sound library. We went for breadth rather than depth. That's why only one placement in Keyboard. However, the ad also appeared in both Musician and Music and Sound Output (both now long gone). On the other hand, as much as I love design, I can't really say the ad had anything consciously to do with introducing the new typeface." Dang. I was blinded by my love of an awesome logo! So, the ad was really just to let everyone know that the Emulator was still alive and kicking, as well as to promote the sound library. I should have known.. the simplest answer is usually the right answer. But, then what about THIS Japanese ad? Was E-mu of Japan really advertising in Keyboard Magazine? Or was this more of the classic E-mu-style of advertising along the lines of the cheeky/funny/witty "Play a turkey" and "Arthur C. Clarke" ads? "The Japanese version was created by our then Japanese distributor for the Japan market, but when I saw it, the idea of placing it in Keyboard without other comment just seemed too good/weird to pass up. So to that extent, yes, we were playing with your minds. Luckily, the same lack of "E-mu accountants" that let me make the Clarke ad color let me get away with this as well. (I.e., Dave and Scott were delightfully supportive of this sort of thing.)" Aaaaaah. Too good/weird to pass up. And the others in the company supported it! End note: Don't forget to check out Marco Alpert's Web site. Great photography, excellent rubber stamp artwork, AND a Quicktime VR clip of KMFDM working in the studio! 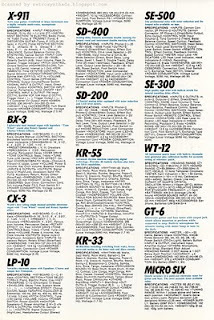 E-mu Emulator 1-page advertisement from page 46 in Keyboard Magazine October 1982. What's this? Is E-mu getting all "conventional" on Keyboard mag readers? Well... maybe. I consider the two earlier Emulator ads that I've posted much more "out there" anyways. First, the attention-grabbing, humorous black and white "Play a turkey" ad had you tilting your head sideways after initially reading the title tag-line. Of course, it all made sense once you started reading the ad-copy. The ad ran during the spring and winter of 1981, but even high profile users such as Stevie Wonder and Daryl Dragon, along with this ad, couldn't help move units into the hands of keyboard players. According to E-mu co-founder Dave Rossum in Mark Vail's Vintage Synthesizers book, "sales just hit the wall at the end of '81". E-mu knew they had to make some changes to the Emulator if they wanted to get sales back up to a respectable level, so on the engineering front, they focused their attention on improvements such as the inclusion of envelopes and a sequencer, as well as providing a "substantial" price break. Then, Dave Rossum went out in the field making those upgrades to Emulators around the world. And then finally, E-mu was off to January '82 NAMM to show off the "Mark 2" Emulator. 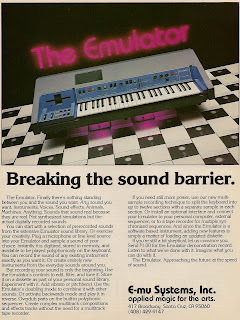 Surprisingly, the Sci-Fi ad ran for only two months, and then E-mu went "radio-silent" on the advertising front. At least that was the case in Keyboard magazine, where there were no Emulator ads for over half a year later. My guess - they didn't need to advertise. According to Rossum (from the book Vintage Synthesizers by Mark Vail), all those upgrades made to the Emulator were a success, and E-mu was shifting 25 units per month. But even with high sales (hard to believe that back then 25/month was considered "high"), you gotta keep your product in front of people, or potentially face the not-so-bright future of not-so-high sales. And so this late '82 "Breaking the sounds barrier" ad appeared out of nowhere in Keyboard, bringing with it some much more conventional style and design. Trendy neon glow, ska-influenced floor tiling, even the tag-line sounds kinda trendy. In a way, the ad looks like it is trying to reach out to all the regular keyboard folks attracted to pretty things. Regular folk with $8000+ to spend on cutting edge technology. The ad-copy is also a lot more descriptive about the Emulator's editing features - now that the Mark II featured envelopes and such. Also, the ad-copy in this ad is also all about the sounds, and more specifically, the sound library, that was growing at an alarmingly delicious rate. 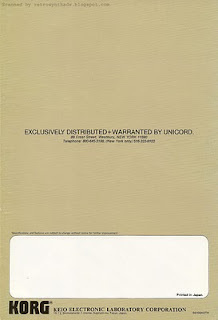 In fact, it was part of E-mu's new '82 marketing strategy to really promote the sample disks that came with the instruments. "Famous samples: the Emulator sample library was used on many famous tracks in 1981 - 83, perhaps the most unusual is the Mexican radio sample which was used in both the bar scene of BladeRunner the film, an forms the basis of the MOD track "Junk Culture". But what's this? As far as I can tell, this ad only ran once in the October 1982 issue of Keyboard. Is that really enough to keep sales up? Did E-mu even need to rely on advertising to sell 25 units per month? Or was two thumbs up from Stevie Wonder enough? Interuptive side note: Now, I realize I just shamelessly used the exact same dramatic effect that I used in my previous Bob Moog/Kurzweil K250 blog post. You know - leaving readers hanging at the end of a paragraph with a mysteriously incomplete thought. But, in that post, I completed the thought on the next line in dramatic bold type. Kurzweil 250 two-page advertisement from pages 74 and 75 in Keyboard Magazine February 1985. Every now and then an ad comes along that makes you just stop dead in your tracks. You just have to pause and take a closer look. This rare 2-pager from Kurzweil is definitely one of them. Right form the start, Kurzweil was building it's brand through advertisements in Keyboard Magazine. There were two previous ads that helped in this respect - the second of which focused on one single aspect of the machine - it's spectacular sampling abilities. In particular, duplicating a $35,000 concert grand piano. He liked the K250 so much, he joined the company as "Chief Scientist". I can't help but make a comparison to Remington razors. Remember the commercials with Remington Product's CEO and advertising spokesman Victor Kiam? "I liked it so much, I bought the company". It doesn't get better than that. Of course, I didn't know who the heck Victor Kiam was back then - owner of the New England Patriots football team apparently. But those big burly men that watched football religiously and who needed to shave three times a day sure knew who Victor was. Just like I sure knew who Bob Moog was. 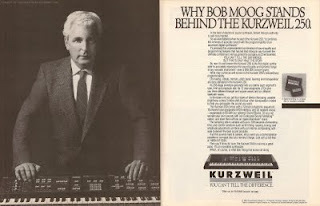 Bob Moog's time at Kurzweil isn't as well known as some other time periods - at least not to me. But a bit of digging into my archives and on the Web brought it all back to me. One of the best sources I've ever come across (which isn't saying much :) is a 1985 interview with Bob Moog by Henning Lohner published in the Computer Music Journal (Vol. 9, No. 4). The three and a half page interview took place in February 1985, only months after Bob Moog took on the full time gig, and contains some great historical information. Coincidentally, it is also the same month this advertisement appeared in Keyboard! 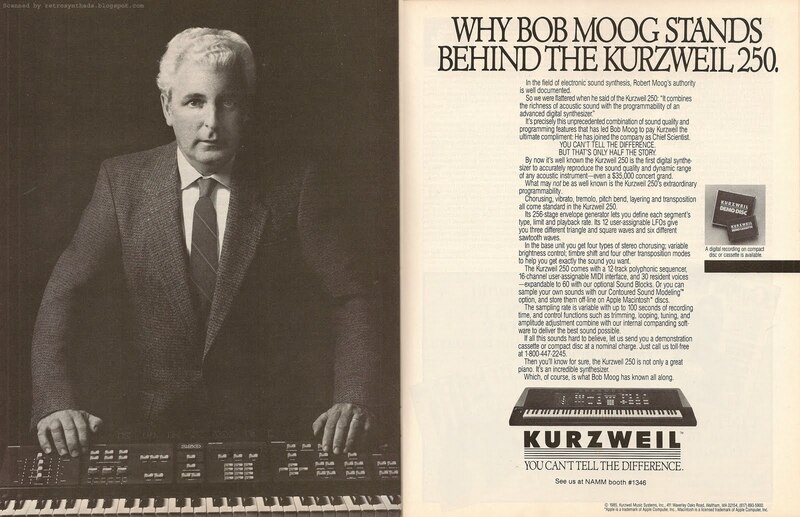 According to the interview article, Bob Moog met Ray Kurzweil and others from the company in the summer of 1983 when he visited "the very first Kurzweil exhibit at the Music Merchants Convention". The K250 didn't exist as a product yet, but there was a "demonstration of a computer program that you could play at the keyboard". Bob was initially hired as a consultant for Kurzweil at the beginning of 1984 in keyboard design, in particular "making certain recommendations to improve the keyboard feel" of the K250. Like most consultants, by the end of 1984 he had worked on several products, and was made an offer that was, according to Bob Moog, "very attractive", so his family moved to Boston in the fall of 1984. When asked by Lohner about his function at the company, Bob replies that "it's a very interesting position, for someone like me who has a lot of ideas, but not much administrative capability". Bob goes on to say that his title is "Chief Scientist", but that "it doesn't really describe what I've been doing. I exist partly in marketing and partly in engineering". Bob also notes that "a very little bit of my work ended up in the Kurzweil 250 sampling keyboard. A lot more will end up in succeeding products". The interview also discusses all the features, options and pricing of the K250, including sampling, MIDI and computer connections. For example, Bob mentions that Kurzweil chose to work with the Macintosh for its graphic abilities, the compatible operating systems (both were MC680000-based), and the fact that this brand of computer was becoming more popular and readily available. The whole article is excellent stuff! I love reading old "Computer Music Journal" magz, for the articles and the ads at the back. You can also find some good information online, but you have to do a bit of digging. Bob Moog's Wikipedia page makes only a brief mention of his time at Kurzweil from 1984-1988, where after quitting, he returned to Ashville to teach music at the University of North Carolina. The page does note that he helped design the K2000, but unfortunately, neither the Kurzweil page or the K2000 page mentions his name at the time that I write this (April 18, 2011 mostly). Luckily, the K250 Wikipedia page does mention his name as one of the consultants in it's development (the machine, not the page :o) . Interestingly, it also mentions Alan R. Pearlman, founder of ARP, as another consultant. I continued searching the Web for more information about Bob's role at Kurzweil, and one of the first search results was a November 2005 tribute to Bob Moog by Ray Kurzweil in Wired Magazine. Most of the article is about Bob Moog's life, but the second last paragraph does contain a small nugget of info on Bob Moog's time at Kurzweil. "Starting in 1984, Moog spent five years working for Kurzweil Music Systems as vice president of new product research. His thoughtful approach was of great help in realizing our ambitions. He would sit silently during executive committee meetings, not out of indifference or distraction, but because he was listening intently. Invariably, at a crucial moment, he would offer his considered opinion, delivered with a gentle voice of authority and spoken from a deep appreciation of the musician's perspective." "He was a sage advisor on our plans and designs,” said Ray Kurzweil, who [w]as CEO of Kurzweil Music Systems at that time. “He was particularly sensitive to the needs of the users, and articulated the musician’s perspective. He was very interested in new ways of controlling music." "This a recognition richly deserved for your seminal contributions,” said Kurzweil. “I greatly value the years we spent working together at Kurzweil Music Systems during the late 1980s, and the times our paths have crossed since. Your consistently thoughtful insights into the art and science of creating music, and the intimate interaction between the musician and her musical instrument, have always deeply impressed me. I have to say that you’re one of those people whose ideas I always listen to most carefully." There is a link to view Ray Kurzweil's congratulatory remarks honoring Bob Moog, to appear in the 2002 Grammy Awards program, but it unfortunately doesn't work. End note: I like Bob's title in the ad, "Chief Scientist", a lot more than his actual title that was apparently Vice President of New Product Research. And he does refer to himself as Chief Scientist in that early 1985 article, so it must have been his title for at least a while. 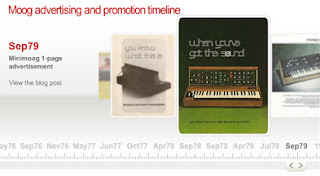 I've created a new Retro Synth Ads' Advertising and Promotions Timeline Tool to help readers quickly find a particular ad/blog post without having to scan through the increasingly long list of labels that travel down the left side of the blog. Keep reading if you want to know more about the tool, or just click on the image above to go directly to the new timeline tool page. I got the idea for the timeline tool while researching a similar feature for a work project. As soon as I came across this little Flash tool online, I instantly saw the potential to allow visitors to quickly flip through the ads that I've blogged about. I could have just posted a page with small thumbnail images, but hopefully lining up the ads in a timeline format helps add a bit of value. It's really interesting to quickly flip through each company's ads and see the evolution of design through the 70's and 80's. 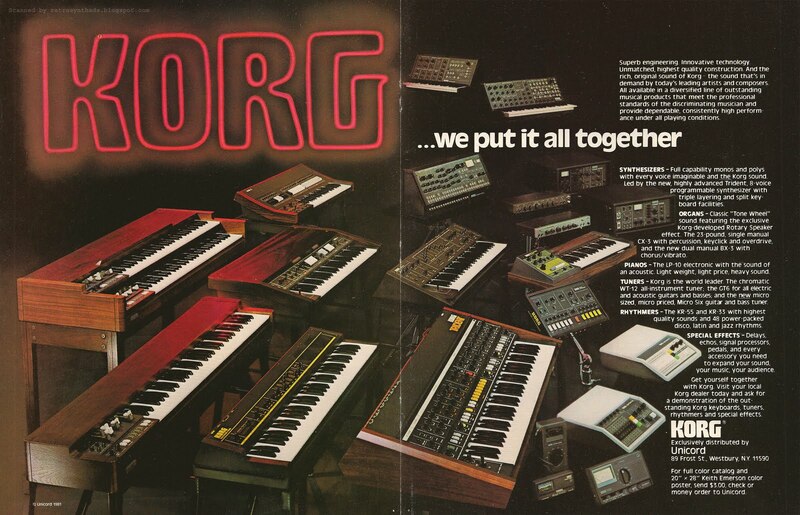 Color, style, layout - you can start to get an idea of how Korg or Moog ads transitioned from one marketing and design concept to another. Keep in mind there are still holes in each timeline - not all ads have been added yet. But over time it should all fill in. Right now, as proof-of-concepts, I've just created timelines for ARP, Korg and Moog - all linking back to each ad's corresponding scans and blog posts. In order to accommodate the new timeline feature, I had to make a few adjustments to the blog. I was originally going to change the site to one of the new Blogger templates, but the more I fooled around with the options, the uglier it got. So, I decided to try and just tweak the current design by clicking on that scary Edit HTML button. I'll deal with a site redesign another time. As for the tweaks.... first, I widened up the blog. But then the blog post font felt really small, so I enlarged it a tad - much easier to read in my opinion. But then it made the blog post titles look wonky, so they needed to be slightly adjusted too. And so on... and so on. Overall, a fun project. Will add more timelines in the near future. Korg Mono/Poly synthesizer advertisement from page 46 in Keyboard Magazine April 1982. 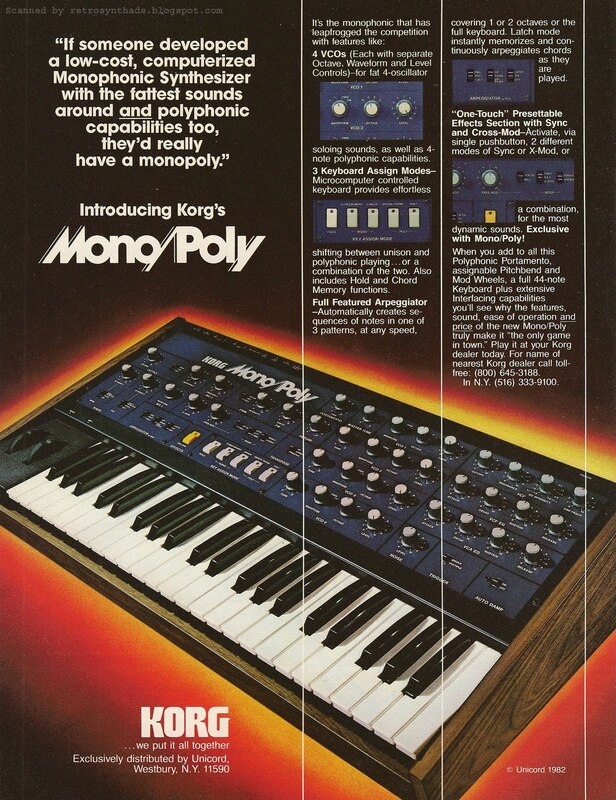 The Korg Mono/Poly was the Polysix's partner in crime. They both started appearing in Keyboard in April 1982 and finished their magazine runs within a month or so the following winter. And although they were technically two independent ads, they often showed up directly opposite each other - and it was a beautiful sight. 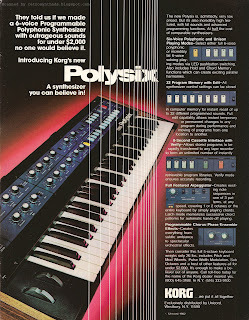 The style of the Mono/Poly's ad was very similar to the Polysix and the Korg Family of Products ads that appeared during the same time period, sharing common design elements such as the dark background, glowing neon around the central photo (the Korg name in the family ad) and those peculiar white vertical lines running directly through the instrument. In this ad, those lines actually play a more functional secondary role in separating the two columns of ad-copy. And about that ad-copy... unlike the two other Korg ads with their one column of text along the right side of the ad, the chubby nature of the Mono/Poly and thus the photo in the ad made this impossible. So the designer cleverly rearranged the text in two columns above the keyboard photo, allowing the keyboard in the photo to be angled similarly to the Polysix keyboard - although in the opposite direction. The result, the two ads still kept their balance when appearing directly opposite each other in a magazine like Keyboard. Nice! No... not just because of that article. 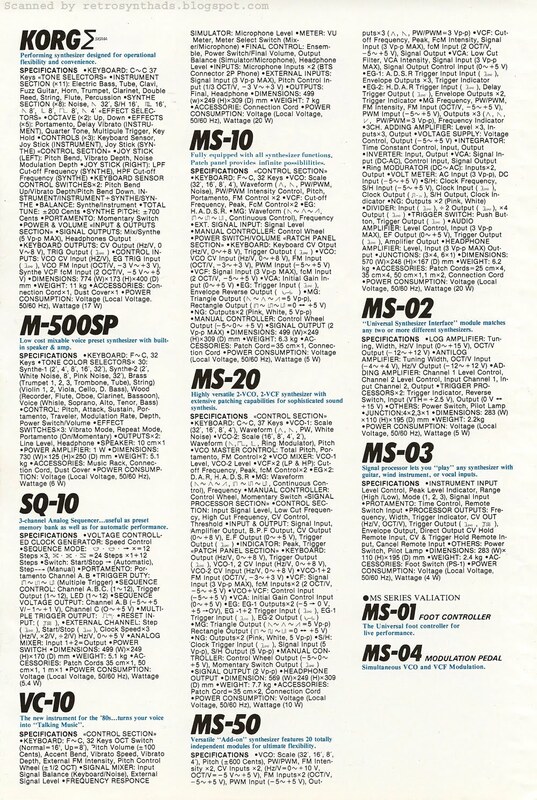 But because when you received this issue in the mail or picked it up at your local keyboard store, your trembling hands would have excitedly flipped open the cover to reveal both the Mono/Poly and Polysix ads sitting directly across from each other on the inside front cover and page 3. But then, your mind would have subconsciously noticed that that front page felt a little bit thicker than normal, and you would then realize that Korg splurged for a fold-out cover. 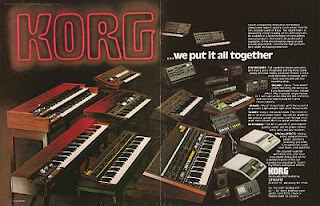 And when you flipped open the Mono/Poly ad, it would reveal Korg's "We put it all together" 2-pager ad. Four juicy pages - it's almost enough to make your head explode. Korg did such as good job of marketing the Mono/Poly and Polysix together that they even somehow got the instruments featured together in a single Keyboard Reports review - the same month the ads started to appear (April). Maybe it was fluke, but if not, nice work Korg! Dominic Milano does a great job reviewing the two keyboards, positioning both as a way to "expand your set-up without spending a lot of money". He introduces both instruments in a joint introduction, before going into the details of each piece in separate mini-articles. For the Mono/Poly - "pronounced like the popular game" - Dominic explained right from the start that new users "may be a little confused by the type of polyphony it offers at first, since there are some differences from the standard Minimoog-clone monophonics and voice-assignment polyphonics that have saturated the market". And he again brings this initial confusion up in the conclusion, while adding that "after spending some time with it, you may find some unusual and striking applications for its various key assignment modes, and that it is, with some practice, a very playable instrument". Most importantly, the review included the attractive price of the Mono/Poly: $995.00. Nice price point. For the Polysix, Dominic explained that "it's certainly not a do-everything design, but it may do enough to suit the needs of players who are looking to extend their rigs with a programmable polyphonic who don't have a lot to spend. It doesn't have a lot of functions, but what's there has been well thought-out to give you a good sound for your money". And he concluded that it "sounded a lot nicer that we expected it to given that it has a single oscillator per voice". He specifically points out how the independent LFOs and sub-octave generator help fatten up the sound, and how the filter has "a haunting quality". Price? Another great price point: $1995.00. The one really surprising thing I noted from the review (and included above) is that the Mono/Poly is pronounced like the game "Monopoly". I have never pronounced it this way, and now realize why so many people would look at me funny when I would refer to the synth when talking to people. And they obviously thought others would have this problem, which is probably why they included that first quote in the ad-copy of the ad that referenced the game. For what it's worth, I have the same problem with the pronunciation of "Moog", which apparently should be pronounced like "Rogue", not "Moon". To this day I still catch myself. And so do others. Korg Polysix synthesizer advertisement from back inside cover page in Keyboard Magazine April 1982. There's just no stopping the Korg-love that's been happening around here. Well... in my head anyways. And to help me wrap my head around all the Korg posts lately, I had to go back and read a few past ones. When I did that, I realized just how much I had been jumping back and forth in the space-time continuum. First with the KPR-77 ad from '84, and then jumping back to '81 with the KR-55 ad. Then back to '84 with that Poly-800 2-pager and poster/brochure, and finally back to '82 again with the Family of Products ad and accompanying poster. I don't write this all out to try and generate page views, but to get an idea of where the gaps are. Believe me, Korg was pumping out ads, and my jumping around created more than a few gaps. I thought I would start with this Polysix ad since it has so much in common with other recent Korg ads I've posted. 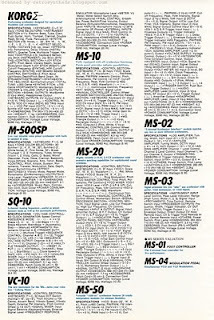 The ad began appearing in Keyboard in April 1982, and continued to run pretty much monthly until January 1983. It follows the same basic design style introduced in January's Family of Products ad that included a dark background, neon glows (this time appearing around the central Polysix photo) and a column of text traveling down the right side of the ad. "I'm not sure I like the fact that there is a solid white line running vertically through it [the photo in the ad]. It doesn't really get in the way of any detail in the photo, but whoever the designer was had some big balls to try and get away with it." And if I thought the designer had big balls for drawing a single line through that photo, then the person who approved the 16 lines going through this Polysix photo is the Ron Jeremy of art directors. The ad-copy is quite interesting. I'd use the word "strategic" - but I would just be guessing ( like - when am I NOT just guessing :D ) As mentioned, this ad started running in April, two month before Roland's Juno-6 ad appeared. And although the Polysix was quite a bit cheaper than previous polyphonics, it was still quite a bit more expensive than the Juno-6. 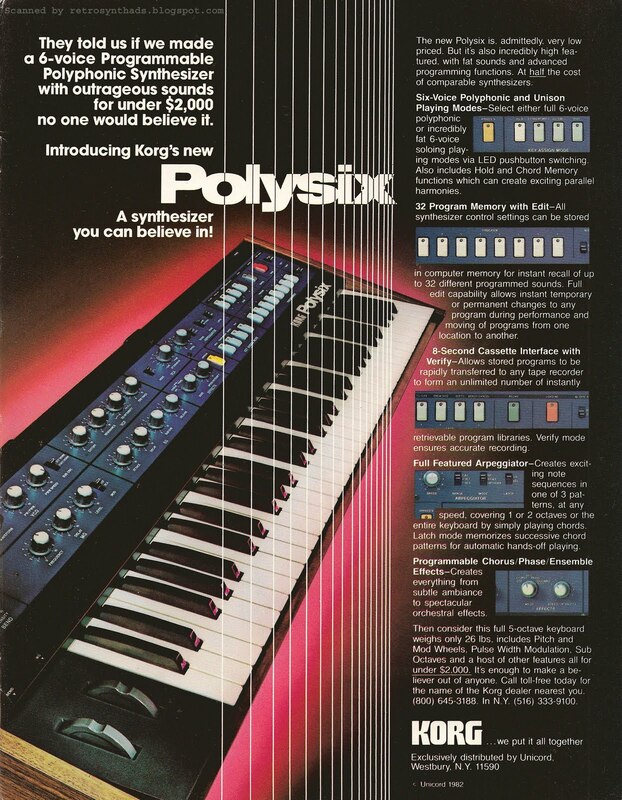 But it also offered a lot more features than the Juno-6 - and Korg had the foresight to make sure they didn't skimp on the ad-copy to explain all the features that the Polysix had: Six voices, 32 program memories, arpeggiator, and on-board effects. In fact, as I mentioned in a previous post for the Roland Juno-60, there was just so much packed into the Polysix that Roland had to replace the Juno-6 with the Juno-60 just to keep up with Korg. The Wikipedia page for the Polysix is quite well done with a lot of good reference information, links to other Polysix pages including Vintage Synth Explorer (with a relatively good comments section!) , Synthmuseum.com, and even a link to the manual (PDF). A Wikipedia page doesn't get much better than that. One of the most interesting sites I found through Google was "Old Crow's Synth Shop: Korg Polysix Upgrade and Repair Overview". It contains some great step-by-step instructions for keeping your Polysix in top notch shape. Nice photos too. What a versatile machine. Yummy. 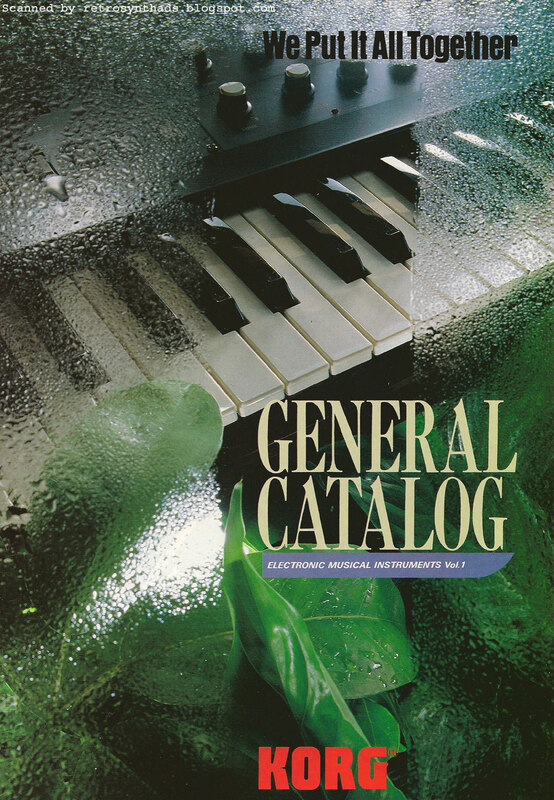 Korg General Catalog, Electronic Musical Instruments, Volume 1, 1982. 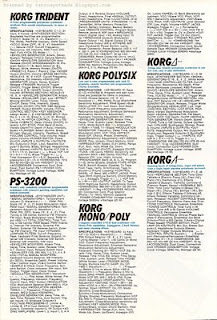 I had already pretty much finished my blog post for the Korg "...we put it all together" family of products ad from the January 1982 issue of Keyboard Magazine, when I went back to re-check something. I pulled a different copy of that January issue off the shelf, and wouldn't you know it, stapled into the centrefold of that ad was this miniature Korg catalog. We are talking 10 juicy pages of Korg products (well, 8 pages, plus a cover and mailing label), folded down to just under 7 x 10 inches. 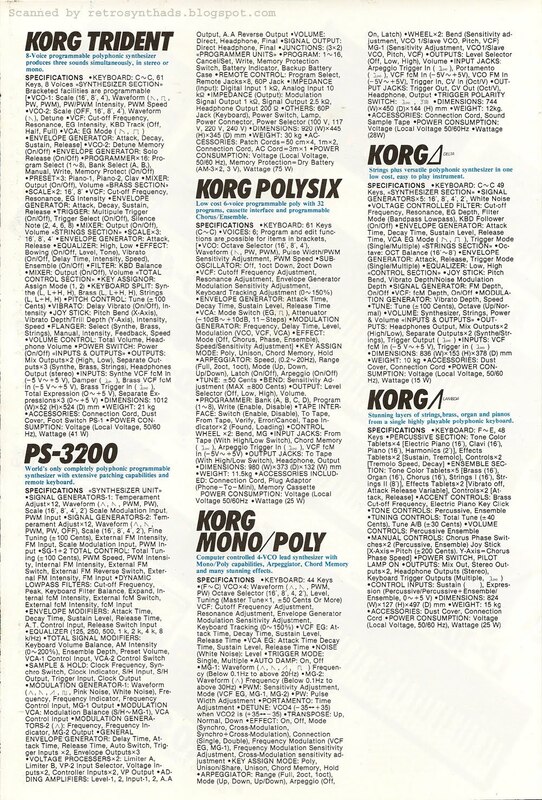 And, unlike in the two-page ad where Korg was a little more limited by space, this catalog contains not only three pages of photos of all their current product line-up, but another three pages of all the reference info for those products - over 25 of 'em! An historical reference gold mine. I've scanned and posted the front side of the catalog as single pages, but merged the back pages into two larger scans due to the way text and images flowed between the pages. Gah. Whatever. The effect is still nice. And it's always nice to stick something organic like a plant into a synthesizer ad. A nice touch. The centrefold ad that accompanied this magazine mentions that you could send away for a full colour catalog. And since this catalog includes a mailing address page, I'm betting this was, in fact, the catalog being referred to in the ad - and included in the January issue of Keyboard as an extra. Excellent work, Korg! Where it gets really interesting is comparing this 1982 catalog to the one Korg put out in 1984. 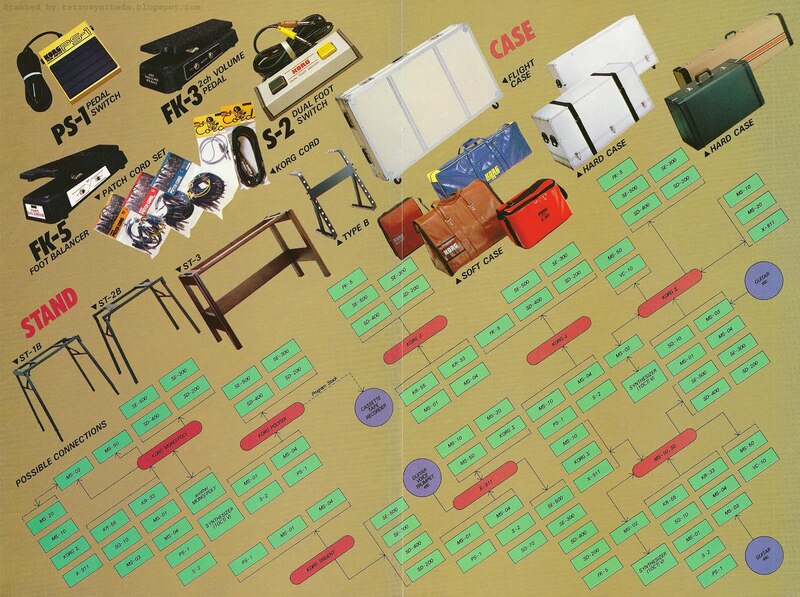 In particular, it is interesting to see just how many products were still available. Only two new polyphonics became available in those two years - the Poly-800 and Poly-61. 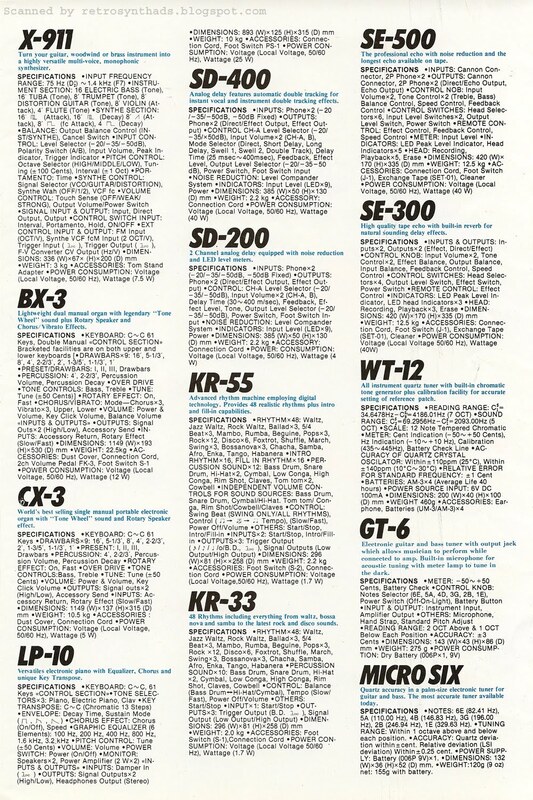 But in Korg's defense, they did update the Trident, as well as expand other areas of the business as can be seen in the piano/organs and rhythm/sound effects sections of that '84 catalog. Also interesting is how Korg was definitely increasing the plastic-to-wood ratio. 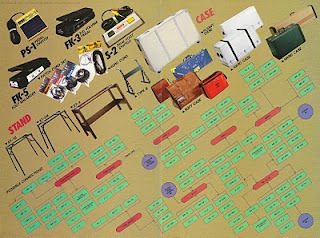 But the absolutely crazy-coolest thing about this catalog is the "Possible Connections" section located underneath all those lovely Korg accessories. I love diagrams, and I guess Korg was making their point: "We put it all together". And now I know my MS-20 will work with an MS-02.